Kogane Yama, Homegrown Tendon Concept @ Bugis Junction | JACQSOWHAT: Food. Travel. Lifestyle. From the people who brought you Chir Chir and Masizzim in Singapore, the latest tendon restaurant Kogane Yama is the group's first original dining concept housed in Bugis Junction. 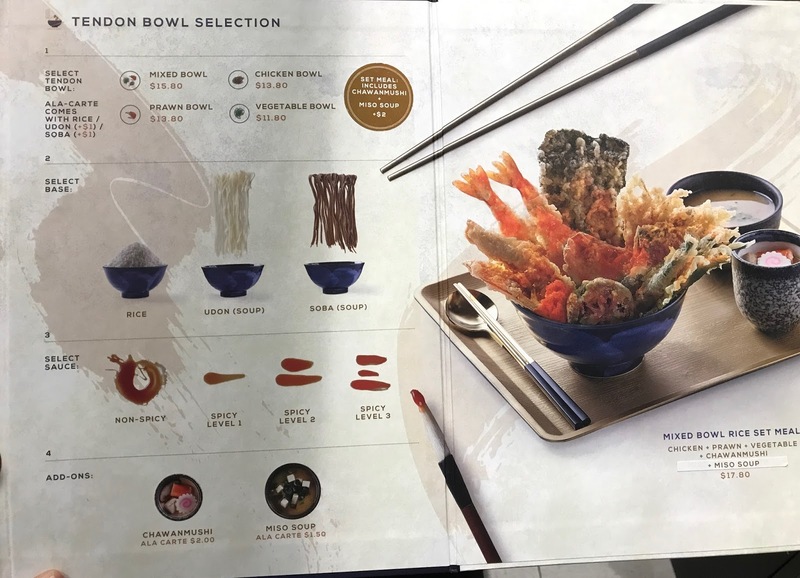 Being able to customize your Tendon bowl is what sets them apart from the other tendon joints, such as picking your preferred staple - Rice, Udon or Soba. 1) Chicken Bowl S$13.80 - If you can't take or not a fan of the usual prawn tempura, you may opt for this that features chicken fillets as well as vegetable tempura alongside. 2) Prawn Bowl S$13.80 - Likewise, this is cater to the opposite group of people - the seafood enthusiasts. If you specially fancy prawn tempura, this is definitely for you, with vegetable tempura at the side. 3) Vegetable Bowl S$11.80 - This is for the vegetarians out there, loaded with assortment of battered veggies such as long beans, carrot, shiitake and enoki mushrooms, sweet potato, green pepper and more. 4) Mixed Bowl S$15.80 - As the name goes, this bowl include a mix of everything featuring tempura prawns, chicken fillet, long beans, carrot, shiitake and enoki mushrooms, sweet potato, green bell pepper, seaweed, shiso leaf and a dollop of ebiko. Add-Ons: You can add on $2 to create a set meal which includes Chawanmushi and Miso Soup. After you have decided which bowl to go for, select your preferred base next. You can choose to go with the classic Japanese short-grain rice or top up a dollar with either Soba or thin Udon - both steeped in a clear and light dashi broth. The tempuras on the other hand were lightly battered and fried to crispy, I will personally prefer to pair my tempura with a bowl of light noodle soup, to balance the palate after much fried elements. If you ordered the noodles as your base, your tempura will be separated in a plate like this. Tip: If you are a smaller eater, you can order a set to share the tempura among 2 person, then additional ala carte order a rice or noodle as your staple. Lastly, customization goes a step further with the selection of one of four tentsuyu sauces - a sweet and savoury homemade blend of garlic, sesame oil and Japanese shoyu. The non-spicy version is perfect for kids and those who can't take spicy. The selection followed by spicy level 1 to level 3 - three different levels of heat. To spice things up a little, I would say go for either level 1 or 2. For something more fiery, level 3 it is but it really depends on individual. For a tip, I suggest requesting to the staff to separate the sauce, instead of them drenching it on your tempura. This way, you can have more control on the spiciness. Unlike other tendon eateries where most of their kitchens are open concept, Kogane Yama's kitchenette is tucked at the back of the store and rest assured that you won't reek of oil after dining in. I will definitely be back here for being able to customized my tendon bowl to my preferred base as well as the generous portion. Kogane Yama is the latest addition to the Tendon options we have in Singapore, I am currently torn between this and Tendon Ginza Itsuki - in terms of money value and quality.